Are autistic people lost in space? In one short paper, Elizabeth Pellicano and colleagues claim to demolish Simon Baron Cohen's systemizing account of autism. They also conclude that autistics' strong visual search and probabilistic learning abilities fail in large-scale space, ergo in the real world. The press release starts by declaring that autistic children "lack visual skills required for independence" and does not exaggerate the claims in the paper, which merit a lot of scrutiny. So bear with me, this is not going to be short. First what they did (and didn't do), then what they found, then what it means. 1. What did they do? And what didn't they do? Pellicano et al. 's purpose was to assess systemizing in autism by testing autistic visual search abilities in true-to-life large-scale space. And this research group has the set-up for it--a room-size visual search task. Except they ignored this possibility, instead choosing what they themselves call a test of "non-visually guided foraging." In other words, Pellicano et al. do not include visual search tasks at any scale, so you can't draw conclusions from their paper about visual search abilities in autism. It took place in a 4m by 4m space arranged as shown. 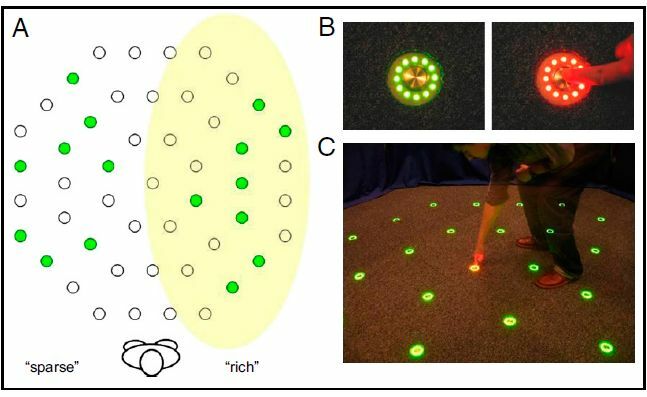 In two 20-trial blocks, 20 autistic and 20 nonautistic children (age ~11yrs) had to find which of 16 green floor lights, eight on each side of a midline, turned red when pressed. The children were not told that 80% of the concealed red targets were on one side of the room ("rich" side) with only 20% on the other ("sparse" side). The task instruction was to find the red target as quickly as possible. But search all you like, in this paper you will find no data about how quickly the participants found the targets. The researchers left out this available measure. They left out number of green lights hit before finding the red target. They left out how many first touches were on the "rich" vs "sparse" sides of the room. They left out almost every measure they previously deemed important to assess performance on foraging tasks in large-scale space (e.g. here, here, here). They seem also to overlook their previous systemizing-relevant (you would think) finding of no male-female difference in performance on the same foraging task (experiment 2 here). Another of their own previous findings is that children's foraging performance is related to their performance on the Corsi block task, a measure of spatial memory. Autistic children don't necessarily show a deficit on this task (e.g. here), but in Pellicano et al., they did. If the goal wasn't simply to assess spatial memory, why not match groups on this ability? 2. What did they find? Their main measure was sensitivity to probability in the foraging task which, ignoring their previous work, they defined as percent of visits to the rich side of the room. Here the authors report "no overall effect of group," never mind media reports (here is one). There was an effect for the first block of trials, where autistics visited the rich side for 45.50% of their touches vs 61.50% for nonautistics. In the 2nd block, the figures were 62.25% and 63.25%. Two additional novel foraging measures involved total length of paths to the red target, per floor distance between green lights. These were assessed with highly sophisticated but conspicuously small-scale methods suited to eye-scanning and/or non-foraging pencil-and-paper tasks. So it doesn't matter how much time you take, or how much you have to twist and turn, or how many green lights you have to reach for. All that matters is length of path, and at this level the autistic children were judged significantly (a) less optimal and (b) less repetitive. Because you should ask, according to Pellicano et al., less repetitive means less systematic ergo is now yet another autistic deficit. The final foraging measure was total revisits to green lights, where the autistics had significantly more in the second but not the first block. One autistic child racked up a big chunk of the autistic revisits (more than 3 SDs above the group mean), which might indicate an atypical understanding of or interest in aspects of the task. There is no information about group differences minus the interesting outlier. The two non-foraging measures were the Corsi task where autistic children had a significant disadvantage, and an embedded figures task on which they performed significantly better than their controls (yes, interpreted as a global deficit, without evidence for same). Revisits--outlier included--correlated with the non-foraging measures in the autistic group. There is no information about these correlations for the nonautistic children or about any other correlations. Well first, it's an interesting task, even if it's not a visual search task. But even if autistics totally failed (they didn't, and search all you want again, but you will find no rationale in this paper for the drop-off-a-cliff thresholds pushed by the authors), this task doesn't map easily onto the authors' sensational claims. These include that autistics can't find "shoes in the bedroom, apples in a supermarket, or a favourite animal at the zoo" ergo can't achieve independence. Of course I want a whole lot more data, or an excellent rationale (none is provided) for not reporting most of it. And numerous possibilities were overlooked. There's those other regularities in the distribution of red targets. There were only 40 trials, and each green light position was the target at least once. On the "sparse" side, each position would be the target exactly once (8 targets, 8 positions). The participants were not supposed to notice or be affected by this kind of regularity. No one knows how autistics would have performed if given accurate task instructions (to take the shortest path, as measured by the authors, to the target). Maybe someone else can bring up motor differences, which plausibly are relevant to this "true-to-life" task. And I wonder how clear, for autistics, the task instructions were with respect to revisits. Autistics should be notorious by now for noticing aspects of tasks that nonautistics don't (fantastic example at IMFAR last year), and for exploring more possibilities than nonautistics (examples here and here). Writing this off as a bad thing, as autistics being lost in space or some dire equivalent, is shortsighted to say the least. If you're paying attention, autistics' "less repetitive" and speculatively more exploratory behavior--more aspects of the array are interesting to autistics, more possibilities and probabilities are explored--in "large-scale" space is a predictable finding. There is no reason to trash as useless (or harmful, and Pellicano et al. go there) multiple replications of excellent autistic visual search and probabilistic learning performance. One genuine conclusion is that systemizing, as conceived by Pellicano et al., and also by Baron-Cohen, is too rigid and limited a model to encompass how autistics atypically detect and explore environmental regularities. Postscript: You can find a large-scale space, true-to-life, real-world (and wonderful) embedded figures task performed by an autistic child here. Post-postscript: This post has been included in the 83rd edition of Encephalon. Strange way to start the year. And maybe this recent search from the University of Southampton is actually unrelated to the university. On the other hand, in the current era of autism politics, it seems plausible to wonder whether this is part of someone's assignment or coursework or whatever. And if it is, is the question being asked about all autism researchers, or only autistic ones?